Tourists flock and visit Baguio yearly in search for affordable hotels to stay in Baguio or get a room accommodation that is within the vicinity of the parade route according to the official government website. Some would prefer a cheaper option by renting a transient house to celebrate and witness the traditional feast and they party, drink and take pictures during this month-long celebration during February. In Tagalog, Panagbenga means "Panahon ng Pagyabong" or "Panahon ng Pamumulaklak" although basically, May is the flower month in the Philippines because this is the season of the year when rain starts to fall to fertilize the land, forcing the beautiful flowers to bloom, thereby making the same month the season of the Santa Cruzan or "Sagala". It is the equivalent of spring season in other countries where it is cold or have ice melting to give way to the sprouting of the new leaves and flowers from the soil. This is a parade characterized by beautiful Filipina and handsome Filipino with floats filled with season flowers making it one of the most colorful festivals in the land that tourists come each year just to witness the colorful parade. 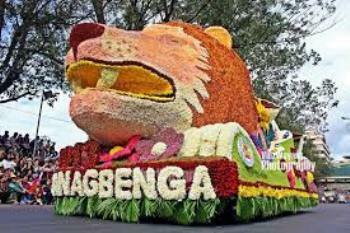 The flower show at the Panagbenga is characterized by the season flowers growing in the summer capital of the Philippines known also as the "City of Pines". It is the only time of the year in the highlands where you can see beautiful flowers in February giving color and life to uniquely designed and customized floats as part of the people's unique culture also for the purpose of winning a traditional contest for the most beautiful themed floating cart. Usually parade starts at the city park or Session Road where you can find near it the amazing 100 stairs of Baguio Cathedral. Designs will be based from a theme which usually highlights all events for the flower festival. Some of these beautiful floats were highlighted by showbiz celebrities - actors and actresses. They go on parade each and every day to celebrate the bountiful harvest of flowers and all the blessings the come and will come the day forward. This feast also symbolizes harmony of the land and nature. 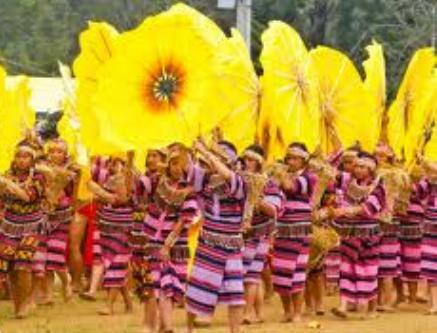 An endless move where tourists and locals alike enjoy taking pictures of the dancing clans dressed in flower-inspired costumes while merry-making called Bendian can be seen anywhere in the long parade of flower floats. This is an Ibaloi dance of celebration which actually originated from the Cordillera Region. It is the time to show off what beauty the highlands have in a flower exhibit so if you are new to such experience, I gladly invite you to witness the yearly event and feel what it's like to travel Philippines. 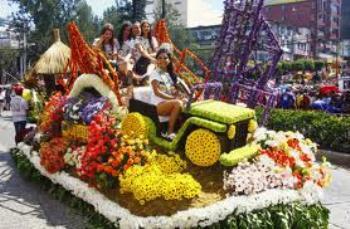 It is also actually a city-wide contest characterized by making the most colorful and most beautifully arranged flowers in a float designed to give life, fun and happiness to the Baguio people. Adding up some spice to the celebration of Panagbenga is having the annual event incorporated with different sets of beautiful fireworks of all sorts everyday. 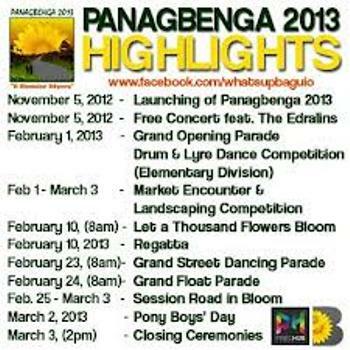 You can also read more abut the feast and watch live stream videos here - http://www.panagbengaflowerfestival.com/. It is also a place where you can see the highlight of the full month schedule of events and updates as well as details about the parade and a gallery of pictures pertaining to the celebration. We have embedded the full video collection of GMA 7 Kapuso Network that featured a set of corporate videos in one hell of a feature parade and street dancing spree in Baguio City's Panagbenga Festival 2013 at the Session Road and other significant parade routes all over the city garden nearest to some of the top tourist spots. For other pictures and videos you can watch, just visit youtube.com or search Google Images to find other interesting colorful photos. 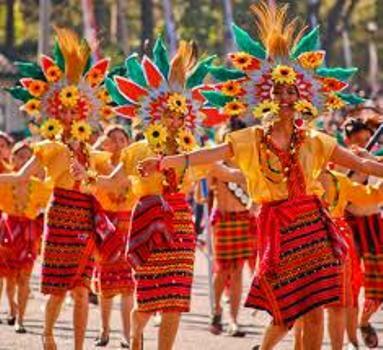 On the other hand, you can visit our page that features the different Philippines Festivals.